Proper care of antique and historical furniture will help preserve its value for future generations. The methods of care for historical or valuable antique furniture have changed over the years. No longer considered just functional, antique furniture should not be cared for or repaired in the same manner as modern home furnishings. The use of polishes, adhesives, fasteners and finishes can dramatically affect the current and future value of such pieces. UV or ultraviolet light is damaging to antique furniture. Sunlight can degrade early finishes, wood and fabrics. Antique furniture should be placed out of direct sunlight, and curtains or shades should be used to diffuse or block sunlight when possible. Clear finishes can yellow or turn opaque from the exposure to sunlight. Avoid placing your antique furniture in front of heating and air conditioning vents, radiators, fireplaces or stoves. 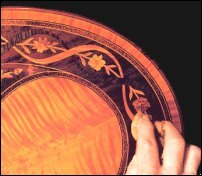 The heat can cause shrinking that can loosen glue joints, veneers, inlays and marquetry. Your antique furniture is also affected by the amount of moisture in the air. Changes in relative humidity can cause wood to expand and contract. This expansion and contraction can cause glue joints to loosen, drawers and doors to drag or become stuck in their opening. Extended periods of high humidity can lead to mold growth, rot and insect infestation. The use of a humidifier or dehumidifier is recommended to help maintain the relative humidity and minimize the adverse effects that moisture can have on your valuable antique furniture. Wood, leather, fabrics and upholstery materials such as horsehair can be inviting to insects and other small pests. Insects such as powderpost beetles or termites eat their way along the grain inside wood until they mature. Mature insects bore their way out of the wood leaving exit holes. Active infestations can be identified by exit holes and a fine sawdust called frass appearing under the piece of furniture. Active infestations should be isolated as soon as possible and an exterminator and/or conservator should be consulted. Cockroaches can damage the existing finish by feeding on the build up of body oils, grease and dirt that has accumulated on the surface. Their excrement can stain raw wood surfaces found in drawers and interior panels. Small rodents are attracted to the upholstery materials found in antiques for use when nesting. Rodent activity should be addressed as irreparable damage could result if left unattended. The idea that antique furniture needed to be fed with oil to keep from drying out is a myth. Wood does not dry out from the lack of oil but rather from the lack of moisture. As such, storage in hot dry areas such as an attic should be kept to a minimum. Furniture oils will temporarily enhance the finish and appearance, but can contribute to the degradation of the finish over time as oils leave a residue that can attract dust and dirt build up. The preferred method of maintaining a varnished finish is a coat of high quality paste wax. Furniture paste wax is stable and long lasting. It will provide protection from moisture and dust and is not permanent. A thin coat of wax applied following the manufacturers recommendation annually will help protect your antique furniture's finish. In between waxing, dusting with a soft, lint free cloth on a regular basis. Dampen the cloth slightly and turn frequently. A dry rag can cause scratches when dusting. Wax may not be appropriate for surfaces with a deteriorating finish; if in doubt, consult a furniture restoration specialist in your area for advice on how to best care for your antique furniture. Silicone based polishes should be avoided as silicone can penetrate the finish and will cause problems with future restoration or repairs. Silicone oil leaves a difficult to remove film behind that affects the adhesion of spot repairs or restoration of the existing finish. With time brass and copper hardware will acquire a soft patina that may appear to some as unattractive. Brass and copper hardware on historical and other valuable antiques should not be polished to remove the tarnished appearance. The original finish and patina should be retained on the hardware including handles, knobs, hinges, pulls and escutcheons. When moving your antique furniture you should check for loose or damaged joinery. Chairs should always be carried by the seat rails as opposed to the back splat, top rail or arms. Tables should be carried by the apron or legs instead of the top which could pull loose from the base. Large pieces should always be lifted and never dragged across the floor. When transporting your antique furniture it's best to first remove shelves, doors and drawers. Protect glass doors with moving blankets or other adequate padding. Large items should be transported on their back or top, preferably their back. Marble tops should be removed and transported vertically. A marble top transported laying flat can crack easily. Mirrors and glass should also be transported and stored vertically. The finish found on historic furniture is as important as the furniture piece itself. Stripping and refinishing removes the original finish coating and damages the patina as well. Once removed, it can never be recovered. Patterns of wear indicating the history of use are also lost during refinishing. The appearance of antique furniture can be enhanced without damaging the existing finish. Consulting a restoration expert prior to treating your antiques will help preserve what only time can produce. Maintaining the original aged finish should be the primary consideration. Avoid placing antique furniture in front of a window or direct sunlight. Avoid placing antiques near air conditioning and heating vents. Don't place your antique furniture near fireplaces and stoves. Dust regularly using a lint free cloth. It's worthy to note that not all antique furniture has significant monetary, artistic or historical value. The notion that removing the finish from any antique or collectible piece of furniture destroys the value is only exaggerated by the simple misinterpretation of comments such as this seen on popular television shows. Many antiques increase in value after the proper restoration or complete refinishing and repair. Consult a professional when in doubt. As always, it's best to err on the side of caution when considering a course of treatment or repairs to your antique furniture. If you believe you might possess a piece with significant historical value or provenance, it's best to consult a licensed appraiser for values and conservator for any repairs or restoration.